When I started blogging, I made the decision not to write about romantic relationships. My love life was pretty much non-existent, and it was an area I felt too vulnerable in to share. I still feel a bit uncomfortable writing about it, if I’m honest. My love life is really happy at the moment, but something still stops me from wanting to be too public about it, possibly because it feels like tempting fate. However I’m going to do it anyway. 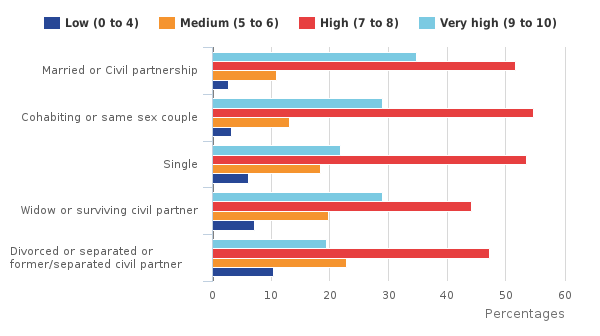 It’s a big omission to leave out romantic relationships when writing about happiness because they are one of the strongest drivers of wellbeing. 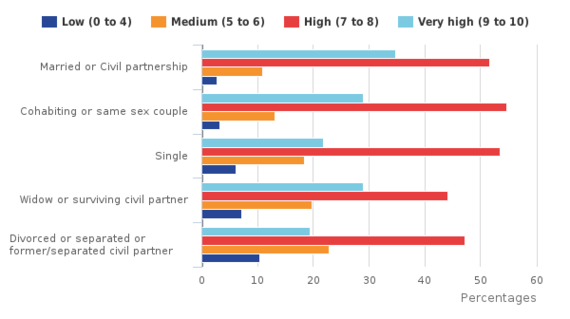 86.3% of married people report high or very high life satisfaction, as opposed to 75.4% of British singletons – see the chart below. I don’t want to depress any singletons reading this on Valentine’s Day. I think the key is connection with others, that is just much easier to make happen when you are in a romantic relationship. We are a social species, and even introverts need to be around others to get a boost (though for less time than extroverts). On average, we need about six hours of time with others per day. I found when I was living on my own and working from home that my mood would sink if I didn’t go out and see friends or family. I learnt to build that into my day to maintain my cheer. It didn’t actually matter if I talked to them much – just working in companionable silence with someone else made me much happier. 1. Ask about his day. This might seem like a small thing, but it is indicative of a much larger shift in attention. I can easily be a bit self-focussed, and want to talk about all the things that have happened to me. But taking a moment to shift my focus onto him and his experience of the day make a big difference to how connected I feel. This is linked to listening properly too. 2. Cook for him. I’m a veggie, and he is a carnivore, so this one isn’t going that well. But I’ve made a few things that he seemed to enjoy, and it’s at least in part the thought that counts. I want him to feel cared for and loved, and I think food is a really good way of doing this (N.B. he also cooks for me – this isn’t a 1950s set up!). 3. Fight fair. We haven’t had too many fights (yet) but it has been really important to me to establish the rules of engagement early on. One rule is that I always remember he cares about how I feel about the outcome – part of his happiness is reliant on my happiness. A second is that I remember the same goes for me and his happiness. A third (which is the hardest for me) is that I wait for the right moment to talk difficult things through – i.e. not when I’m angry but when we are getting on well. A fourth is that I do eventually bring them up, and don’t leave them to fester. A fifth is honesty, including avoiding omission or false implication. 4. Compliment him. If I think something nice, I say it. According to relationship expert John Gottman, couples that last have a ratio of five positive things to one negative thing. I know how much I appreciate a compliment, and it makes it much easier to take on board any suggestions for improvement! 5. Lots of hugs. I read a great suggestion originating from a book by Steven Stosny and Patricia Love to have six six-second hugs with your loved one each day. 36 seconds of huggage should be able to fit into anyone’s day. The human need for touch is such an interesting thing – premature babies in incubators are still taken out and given to their mum to have skin-to-skin contact. Despite the inevitable exposure to germs, it leads to much better outcomes. So it’s still early days for my boyfriend and I – we are in the honeymoon period and haven’t really been tested. But it also feels like are off to a much more positive start than previous relationships. I think at least some of that comes from having had the time to think about things when I was single, and admit and learn from past mistakes. And now, finally(! ), I have the chance to put my thoughts into practice.